In this circuit, we have used Astable multivibrator by using 555 timer IC to generate input signal of frequency ‘f’. Now, in the second phase, we have used a decade counter IC 4017 to divide this input signal frequency by f/2 or f/4. Input frequency can be adjusted by using RV1 potentiometer and output frequency can be switched between f/2 and f/4 by using the SPDT switch. In this Frequency Divider Circuit, we have used a 555 timer IC to generate an input frequency signal. Here we have connected a 10k (R2) resistor between Vcc and pin 7th of 555 Timer (U1). Then we have connected 47k (R3) resistor & 50k Pot (RV1) between pin 7 and 6. Pin 2 is shorted with pin 6 and a 4.7uF capacitor C1 is connected to pin 2 or 6 with respect to ground. Pin 1 is connected to ground and pin 4 directly connected to VCC and pin 8 as well. The output pin of this 555 timer is connected to a LED D1 through a 330-ohm resistor and also connected to clock pin of 4017 counter IC. LED D1 will indicate the frequency of input signal. Before going further we should understand the working of 4017 IC. 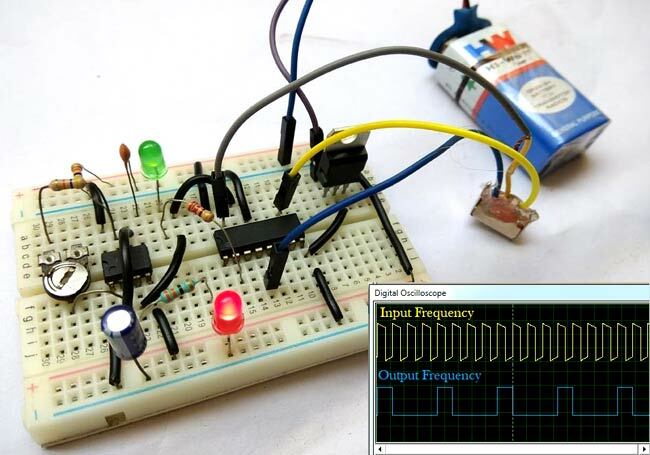 A video for the complete working of Frequency Divider Circuit is given below.